Fort Fredrick, Maryland is located off Interstate 70 at Exit12 on State Route 56 near Big Pool, between Hancock and Hagerstown. The fort was built by Maryland colony in 1756 to defend western Maryland from the French and Indians. It was named Frederick after Frederick Calvert, 6th Lord Baltimore, the colony propriator. It was so strong that it was never attacked. As the photo shows it was designed on the Vauban format for a bastioned trace. The reconstruction did not include the original lunettes outside the curtain walls. The gate is in the southern curtain wall. A faint trace of the foundation of the north lunette is visible in the grass outside the northern curtain. Also visible, inside the fort, is the foundation of the former officer's quarters. The long barracks on the east side now houses representative rooms on the lower floor and descriptive posters on the second floor. The barracks on the western side has the long sleeping quarters for enlisted men. The stone wall is about 3-4 feet thick. According to the park ranger the archeological effort found raised platform and parapets only in the south-western and north-eastern bastions. 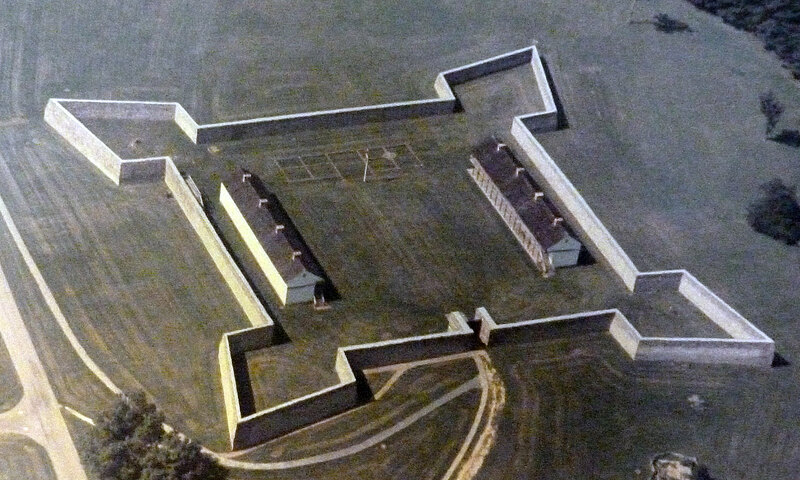 During the American Revolution the fort was used as a prison camp for captured British soldiers. After the war, in 1791, the land including the fort was sold for farming. During the Civil War there were Union troops in the area to guard the C&O canal but the fort was already in ruins. The fort was bought by Maryland in 1922 and during the 1930's it was reconstructed as we see now by Civilian Conservation Corps workers. Now it is the location for much active recreation and historical re-enactments. There are living history programs here on weekends in spring and fall, and every day during the summer. Some of the special events for 2013 are American Revolutionary reenactors on 6-7 April, The Royal American Regiment and Maryland Rangers on 13-14 April, two Maryland companies from the French and Indian War in 11-12 May, Colonial Day in 1 June, the Maryland companies again on 22-23 June, French, British and Indian reenactors on 24-25 August, the two Maryland companies again in 14-15 September, A Civil War program on 5-6 October, and a British Army garrison on 2-3 November. There are many other events as well. Sign welcoming us to Fort Frederick Maryland. Two manikins in the Ft. Frederick visitor's center in uniforms of colonial Maryland in 1750's. A manikin dressed as an American Indian in late 1700's. An aerial view of Fort Frederick showing the fort and the gift shop to its left and a CCC building at base of photo. A sign near the Visitor's Center describing Lee's invasion of Maryland in 1863, which passed near Ft. Frederick. We approach the north-west corner of the fort on the path from the visitor's center through a woods. The north-west bastion and western and northern curtain walls. Closer to the north-west bastion - the roof of one barracks is visible behind the western curtain. The south-west bastion of Fort Frederick with southern curtain and the south-east bastion beyond. The corner wall of the south-west bastion showing how high it is. Fort Frederick - Part of the southern curtain wall with gate and the south-east bastion on the right. The narrow but high gate in the southern wall of Fort Frederick. The eastern barracks building=reconstructed in Fort Frederick. Fort Frederick - typical fire place in each room of east barracks. Storage room on first floor of east barracks with barrels and weapons. Fort Frederick - view of west barracks from second floor of east barracks. Display describing the construction of Fort Frederick by Governor Horatio Sharpe in 1756 -the diagram indicates that the original fort had lunettes outside the curtain walls and 5 bastions. Display of typical farm tools useful at Fort Frederick when the area became a farm. Display describing some uses of Fort Frederick when it was part of a farm. One of the enlisted barracks quarters in west barracks. Another of the enlisted barracks quarters in west barracks. The third of the enlisted bunk rooms in the west barracks of Fort Frederick - this one complete with bedding and other equipment. The CCC museum at Ft Frederick - the fort was reconstructed by the CCC during the Depression.